Under the philosophy that a company’s profits come from a neighboring community, KOLON Industries, Inc. is making a variety of social contributions. “Share Happiness” in Gumi Plant supports Good Neighbors activities. 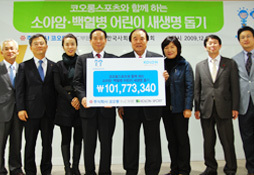 Other volunteer teams of the company and of each plant include: “World Worth Living In” in Gumi Plant, “Hanmaeum Volunteers” in Gyeongsan Plant, “P2 Virus” at the Central Technology Institute, “Sharing Society” in Ulsan Plant, “Boram Society” and “Love Neighbors Society” in Gimcheon Plant (for functional materials). Also KOLON Group has been practicing love for neighbors, including nurseries, low-income families, and child heads of households under the name of “KOLON Family Volunteers”, “Flowers and Little Prince”. 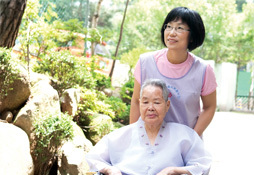 Each plant also shares hope and the fun of sharing with the needy children by forming a foundation for children and sponsoring those children, and organizes support events for the seniors living alone to spend some time with them. Such variety of social activities allow the company to make contributions to social welfare and the growth of local communities and boost employees’ morale. KOLON Industries, Inc. held a donation agreement ceremony with JTS, an international relief NGO, and carried out social contribution projects. Providing support for the third world, including India and Pakistan, JTS is an international relief NGO that attained a special status from the UN Economic Council. KOLON Industries, Inc. agreed to support products equivalent to 500 million Korean won through JTS for three years and join in social contribution activities. KOLON Sports has been selling NewLife T-shirts to help children with childhood cancer and leukemia at all its stores nationwide every autumn. The company donates all earnings of its sale to the NewLife Support Center to provide help. The Green Heart Campaign allows the company to give back to the community and needy neighbors and practice the spirit of sharing.